Legislative History: 699/92, 444/93, 519/93, 909/93, 148/97, 332/98, 380/98, 380/02, 246/03, 63/06, 175/08, 261/08, 339/09, CTR 13 JN 08 - 1, 93/15, 335/15, 407/15, 483/17, 301/18. R.R.O. 1990, Reg. 615, s. 1; O. Reg. 339/09, s. 1. (b) not more than 900 metres apart where the speed limit prescribed is greater than 60 kilometres per hour and not more than 70 kilometres per hour. R.R.O. 1990, Reg. 615, s. 2 (1); O. Reg. 175/08, s. 1. O. Reg. 175/08, s. 2; O. Reg. 339/09, s. 2 (1). O. Reg. 175/08, s. 2; O. Reg. 339/09, s. 2 (2). 4. 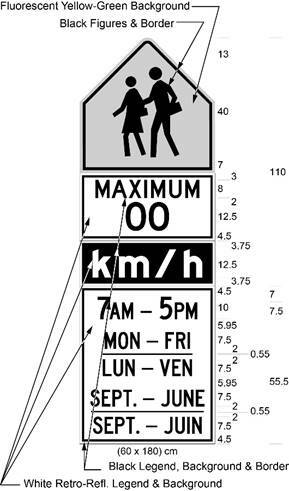 A speed limit sign shall be erected on the right side of the highway, facing approaching traffic, not more than 4.5 metres from the roadway, and the bottom edge of the sign shall be not less than 1.5 metres or more than 2.5 metres above the level of the roadway. R.R.O. 1990, Reg. 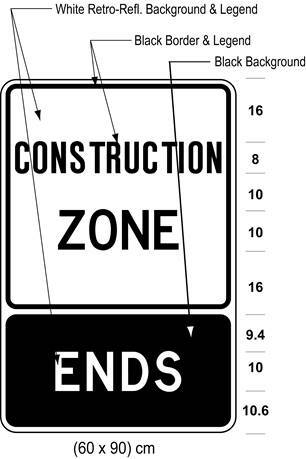 615, s. 4.
shall be erected in accordance with section 4 at the commencement of the portion of the highway so designated. 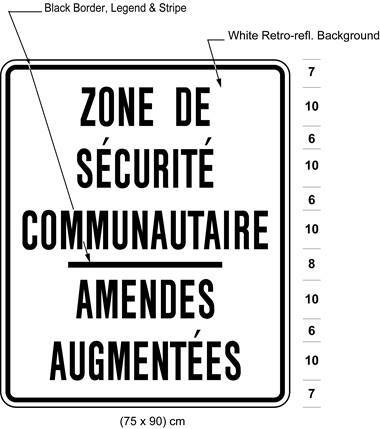 Text alternative: Illustration of “school zone” sign labelled as Figure A. The top portion of the sign contains the symbol of two school children crossing. The symbol is in black and the background is fluorescent yellow-green. The bottom portion of the sign contains the words “MAXIMUM 00” in black text on a white retro-reflective background. The following measurements are written below the sign: (60 × 90) cm. The sign is surrounded by measurements of its different elements. This text alternative is provided for convenience only and does not form part of the official law. 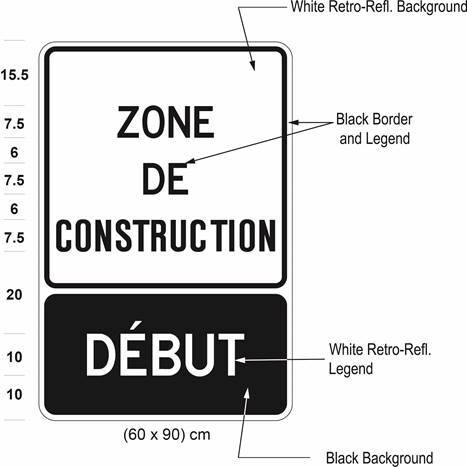 Text alternative: Illustration of “school zone” sign labelled as Figure B. The sign has 4 sections and a 20 cm amber lens on either side of the second section. The top section of the sign contains the symbol of two school children crossing. The symbol is in black and the background is fluorescent yellow-green. The second portion of the sign contains the words “MAXIMUM 00” in black text on a white retro-reflective background. The third section contains the text “km/h” in white lettering on a black background. The fourth section contains the words “WHEN FLASHING” in black text on a white retro-reflective background. The following measurements are written below the sign: (60 × 140) cm. The sign is surrounded by measurements of its different elements. This text alternative is provided for convenience only and does not form part of the official law. R.R.O. 1990, Reg. 615, s. 5 (1); O. Reg. 246/03, s. 1 (1, 2); O. Reg. 175/08, s. 3 (1); O. Reg. 339/09, s. 3 (1, 2). (1.0.1) Revoked: O. Reg. 175/08, s. 3 (7). 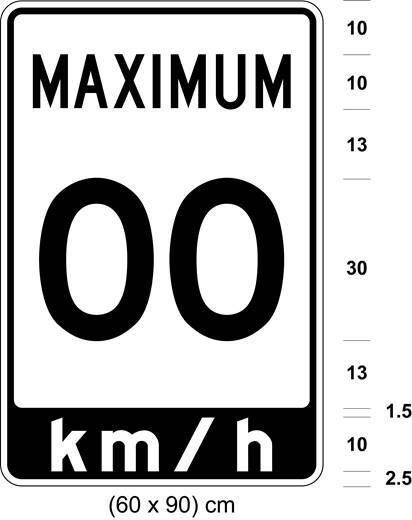 (ii) is similar to the sign in Figure C except that it does not include a tab sign bearing the legend “km/h”. 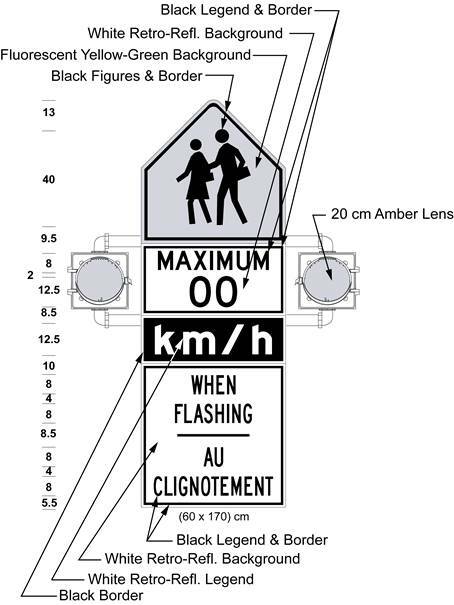 Text alternative: Illustration of “school zone” sign labelled as Figure C. The sign has 4 sections and a 20 cm amber lens on either side of the second section. The top section of the sign contains the symbol of two school children crossing. The symbol is in black and the background is fluorescent yellow-green. The second portion of the sign contains the words “MAXIMUM 00” in black text on a white retro-reflective background. 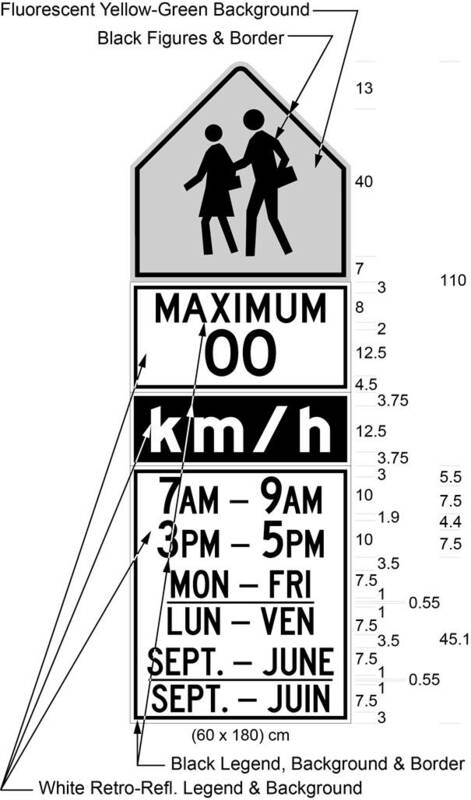 The third section contains the text “km/h” in white lettering on a black background. The fourth section contains the words “WHEN FLASHING / AU CLIGNOTEMENT” in black text on a white retro-reflective background. The following measurements are written below the sign: (60 × 170) cm. The sign is surrounded by measurements of its different elements. This text alternative is provided for convenience only and does not form part of the official law. Figure D Revoked: O. Reg. 246/03, s. 1 (6). O. Reg. 444/93, s. 1 (1); O. Reg. 246/03, s. 1 (4-6); O. Reg. 175/08, s. 3 (3); O. Reg. 339/09, s. 3 (3). (1.2) Revoked: O. Reg. 175/08, s. 3 (7). 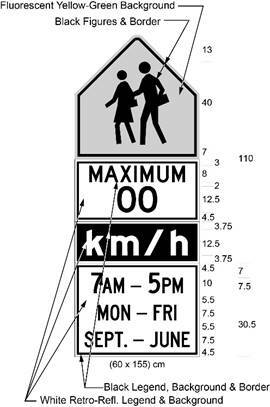 (2) A sign referred to in clause (1) (a) or (1.1) (a) shall be illuminated or actuated and legible during the hours prescribed by by-law under subsection 128 (5) of the Act on days during which school is regularly held. O. Reg. 444/93, s. 1 (2). 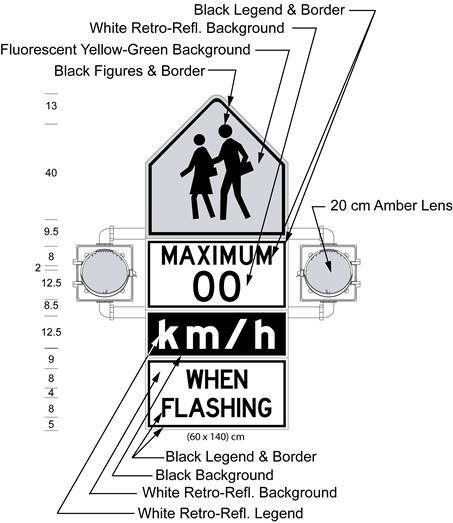 (3) The flashing amber signals on a sign referred to in clause (1) (b) or (1.1) (b) shall be actuated during the hours prescribed by by-law under subsection 128 (5) of the Act on days during which school is regularly held. O. Reg. 444/93, s. 1 (2). (4) Revoked: O. Reg. 175/08, s. 3 (5). 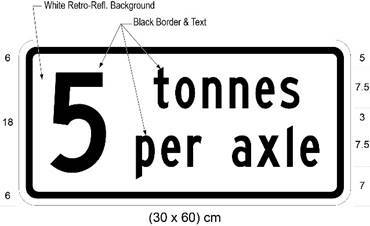 (5) A sign referred to in clauses (1) (a) and (b) shall be not less than 30 centimetres in height and not less than 60 centimetres in width and bear the legend “MAXIMUM” in black letters not less than 8 centimetres in height and display the speed limit prescribed by by-law in black numerals not less than 12.5 centimetres in height on a white background. O. Reg. 246/03, 1 (7). 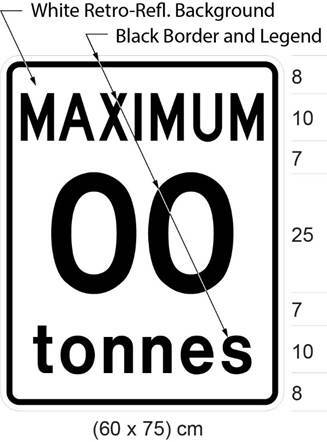 (5.1) A sign referred to in clauses (1.1) (a) and (b) shall be not less than 30 centimetres in height and not less than 60 centimetres in width, shall bear the legend “MAXIMUM” in black letters not less than 8 centimetres in height and shall display the speed limit prescribed by by-law in black numerals not less than 12.5 centimetres in height on a white background. O. Reg. 175/08, s. 3 (5). 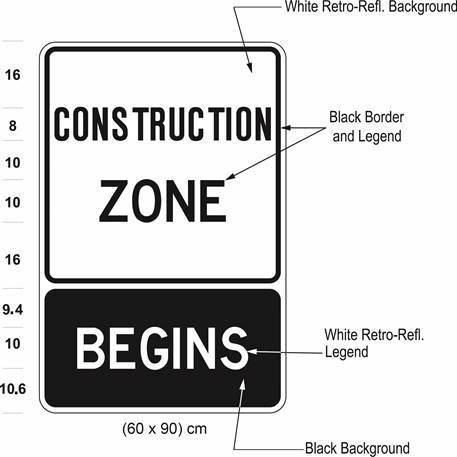 (6) A speed limit sign as prescribed in section 1 shall be erected at the termination of the designated portion of the highway, except that the maximum speed shown thereon shall be the appropriate speed limit for the adjoining portion of the highway. R.R.O. 1990, Reg. 615, s. 5 (6). (7) Sections 1, 2 and 3 do not apply to a sign erected under subsection (1) or (1.1). O. Reg. 444/93, s. 1 (4). (8) Revoked: O. Reg. 175/08, s. 3 (7). 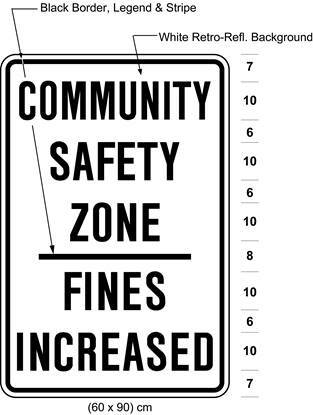 Text alternative: Illustration of “school zone” sign. The sign has 4 sections and a 20 cm amber lens on either side of the second section. The top section of the sign contains the symbol of two school children crossing. The symbol is in black and the background is fluorescent yellow-green. The second portion of the sign contains the words “MAXIMUM 60” in black text on a white retro-reflective background. 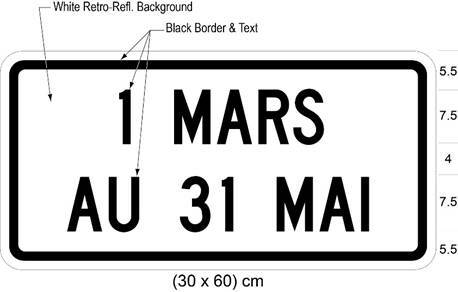 The third section contains the text “km/h” in white lettering on a black background. The fourth section contains the words “WHEN FLASHING” in black text on a white retro-reflective background. The following measurements are written below the sign: (90 × 210) cm. The sign is surrounded by measurements of its different elements. This text alternative is provided for convenience only and does not form part of the official law. O. Reg. 519/93, s. 1; O. Reg. 175/08, s. 4 (1); O. Reg. 339/09, s. 4 (1). 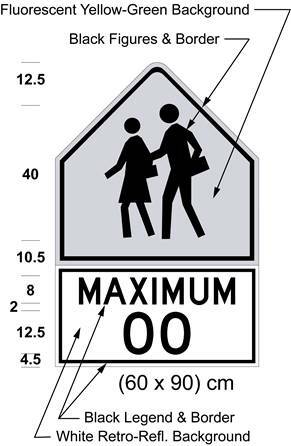 Text alternative: Illustration of “school zone” sign. The sign has 4 sections and a 20 cm amber lens on either side of the second section. The top section of the sign contains the symbol of two school children crossing. The symbol is in black and the background is fluorescent yellow-green. 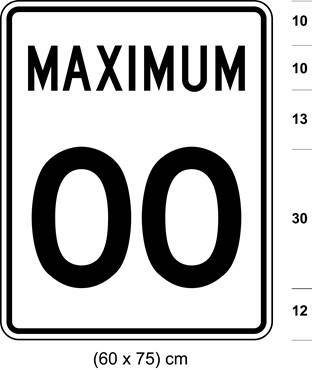 The second portion of the sign contains the words “MAXIMUM 60” in black text on a white retro-reflective background. The third section contains the text “km/h” in white lettering on a black background. The fourth section contains the words “WHEN FLASHING / AU CLIGNOTEMENT” in black text on a white retro-reflective background. The following measurements are written below the sign: (90 × 255) cm. The sign is surrounded by measurements of its different elements. This text alternative is provided for convenience only and does not form part of the official law. O. Reg. 246/03, s. 2 (1); O. Reg. 175/08, s. 4 (2); O. Reg. 339/09, s. 4 (2). (1.2) Revoked: O. Reg. 175/08, s. 4 (4). 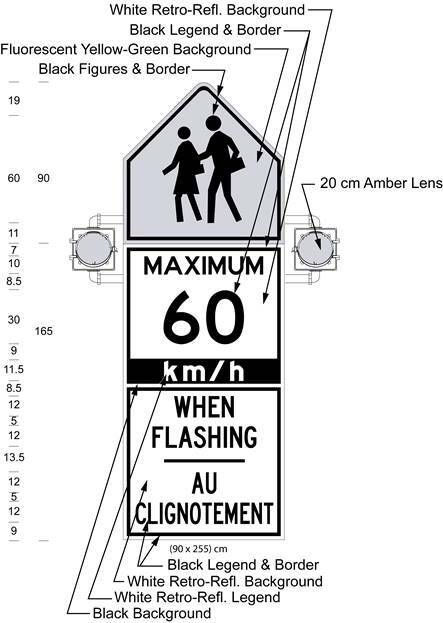 (2) If a sign referred to in subsection (1) or (1.1) is erected, the flashing amber signals on the sign shall be actuated on days during which school is regularly held between the hours specified in section 7 of Regulation 619 of the Revised Regulations of Ontario, 1990. O. Reg. 332/98, s. 1; O. Reg. 246/03, s. 2 (2). 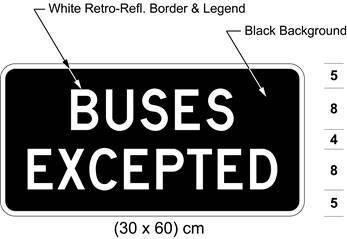 (3) A sign referred to in subsection (1) or (1.1) shall be not less than 210 centimetres in height and not less than 90 centimetres in width, bear the legend “MAXIMUM” in black letters not less than 10 centimetres in height and display in black numerals not less than 30 centimetres in height on a white background the numerals “60”. O. Reg. 519/93, s. 1; O. Reg. 246/03, s. 2 (3). (4) A speed limit sign as prescribed in section 1 shall be erected at the end of the designated portion of the highway, except that the maximum speed shown shall be the appropriate speed limit for the adjoining portion of the highway. O. Reg. 519/93, s. 1. (5) Sections 1, 2 and 3 do not apply to a sign erected under subsection (1) or (1.1). O. Reg. 519/93, s. 1; O. Reg. 246/03, s. 2 (4). (6) Revoked: O. Reg. 175/08, s. 4 (4). 5.1.1 (1) For the purposes of subsection 128 (2.1) of the Act, a speed limit sign as prescribed in section 1 shall be erected indicating the commencement of a designated area within which a maximum rate of speed for all highways within that area has been prescribed to be a rate of speed lower than that specified in clause 128 (1) (a) of the Act. O. Reg. 301/18, s. 1. (2) The speed limit sign shall be erected on each highway that enters the designated area at the boundary of the designated area. O. Reg. 301/18, s. 1. O. Reg. 301/18, s. 1. 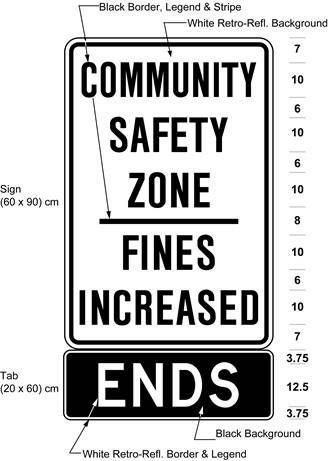 (5) The speed limit sign and sign required by subsection (3) shall be accompanied immediately below by a sign described in subsection 3 (1). O. Reg. 301/18, s. 1. 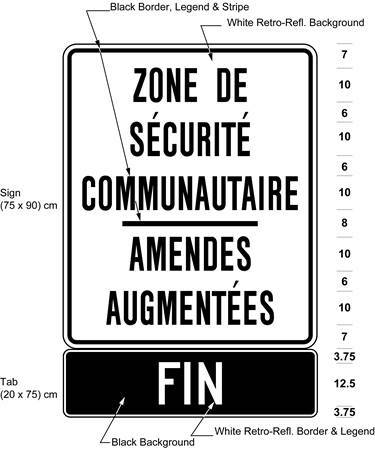 (6) Despite subsection (5), in an area designated by the French Language Services Act, the speed limit sign and sign required by subsection (4) shall be accompanied immediately below by a sign described in subsection 3 (2). O. Reg. 301/18, s. 1. 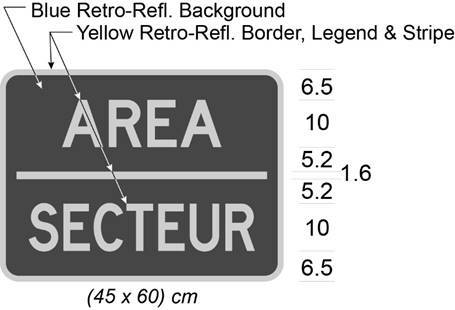 (9) Where a speed limit sign is erected within a designated area other than at the boundary and the sign indicates the rate of speed that is prescribed for the area, it shall be accompanied immediately below by a sign required by subsection (3) or, in an area designated by the French Language Services Act, by a sign required by subsection (4). O. Reg. 301/18, s. 1. (10) Section 2 does not apply to a sign erected under this section. O. Reg. 301/18, s. 1. 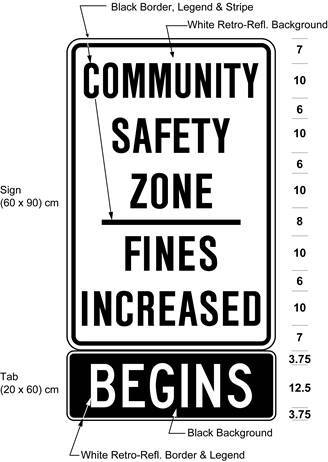 5.2 (1) Where a part of a highway is designated as a community safety zone under subsection 214.1 (1) or (2) of the Act, signs shall be erected in accordance with this section. O. Reg. 380/98, s. 1. O. Reg. 380/98, s. 1; O. Reg. 339/09, s. 5 (1). O. Reg. 380/98, s. 1; O. Reg. 339/09, s. 5 (2). O. Reg. 380/98, s. 1; O. Reg. 339/09, s. 5 (3). O. Reg. 380/98, s. 1; O. Reg. 339/09, s. 5 (4). O. Reg. 380/98, s. 1; O. Reg. 339/09, s. 5 (5). O. Reg. 380/98, s. 1; O. Reg. 339/09, s. 5 (6). (8) Signs erected under subsections (6) and (7) shall be not more than 300 metres apart from each other where the speed limit for the part of the highway on which the sign is erected is 60 kilometres an hour or less, and not more than 2 kilometres apart from each other where the speed limit for the part of the highway on which the sign is erected is more than 60 kilometres an hour. O. Reg. 380/98, s. 1. (b) be octagonal in shape, not less than 60 centimetres in height and width and bear the words “stop” and “arrêt” in white retro-reflective letters on a background of red retro-reflective material. O. Reg. 444/93, s. 2. O. Reg. 444/93, s. 2; O. Reg. 339/09, s. 6. (3) On or after August 1, 2015, no stop sign shall be valid except as described and illustrated in subsection (2). O. Reg. 261/08, s. 1. 7. 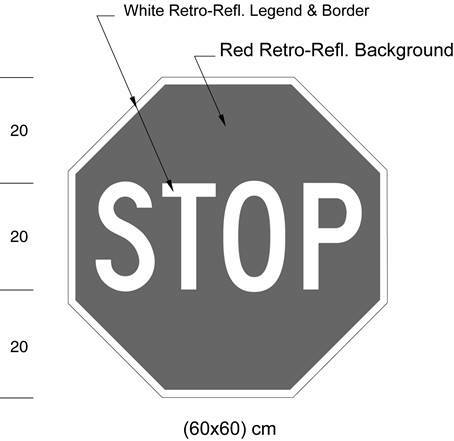 A stop sign shall be erected on the right side of the highway, facing approaching traffic, at a point not less than 1.5 metres and not more than 15 metres from the intersecting roadway or the nearest rail at a railway crossing. R.R.O. 1990, Reg. 615, s. 7; O. Reg. 63/06, s. 1. 8. A stop sign shall be erected so that the left edge of the sign shall be not more than 4 metres from the edge of the roadway. O. Reg. 63/06, s. 2. 9. 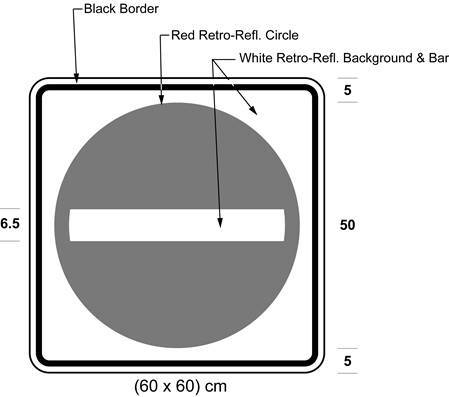 A stop sign shall be erected so that the bottom edge is not less than 1.5 metres and not more than 2.5 metres above the level of the roadway. R.R.O. 1990, Reg. 615, s. 9. O. Reg. 444/93, s. 3; O. Reg. 339/09, s. 7. 11. 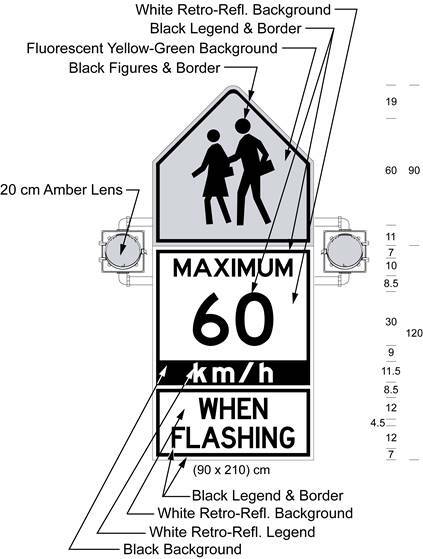 (1) A school crossing stop sign shall be octagonal in shape, not less than 30 centimetres in height and not less than 30 centimetres in width. O. Reg. 380/02, s. 1. 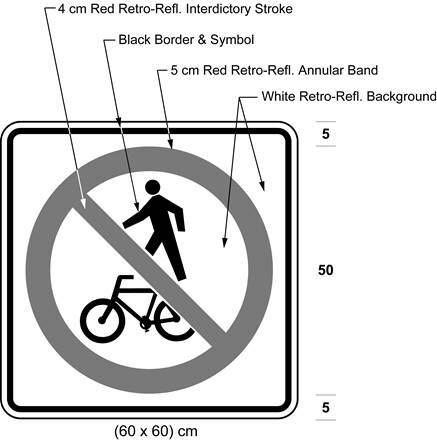 (2) Each face of a school crossing stop sign shall bear the word “stop” in white retro-reflective letters not less than 12.5 centimetres in height on a background of red retro-reflective material. O. Reg. 380/02, s. 1. (3) Each face of a school crossing stop sign may bear a single flashing red light centred above or below the word “stop” that is visible to the traffic approaching the sign. O. Reg. 380/02, s. 1; O. Reg. 63/06, s. 3. 12. 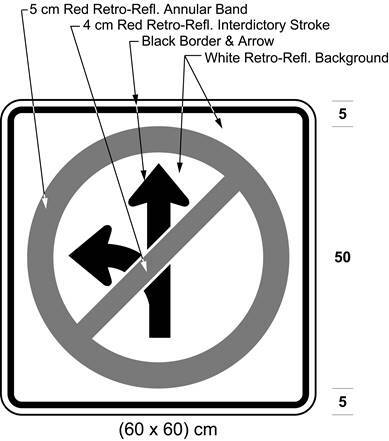 Sections 45 and 46 do not apply to a school crossing stop sign. R.R.O. 1990, Reg. 615, s. 12. Text alternative: Illustration of “no stopping” sign with a black stop symbol inside of a red circle with an interdictory stroke indicating no stopping and black arrows pointing left and right. The measurements are written below the sign: (30 × 30) cm. This text alternative is provided for convenience only and does not form part of the official law. R.R.O. 1990, Reg. 615, s. 13; O. Reg. 339/09, s. 8. 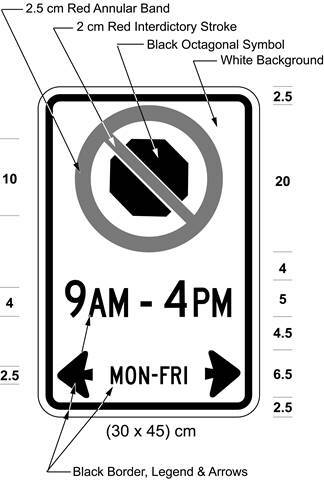 Text alternative: Illustration of “no stopping” sign with a black stop symbol inside of a red circle with an interdictory stroke indicating no stopping and the text “9 AM - 4 PM” and “MON-FRI”, with black arrows pointing left and right. The measurements are written below the sign: (30 × 45) cm. This text alternative is provided for convenience only and does not form part of the official law. R.R.O. 1990, Reg. 615, s. 14; O. Reg. 339/09, s. 9 (1). 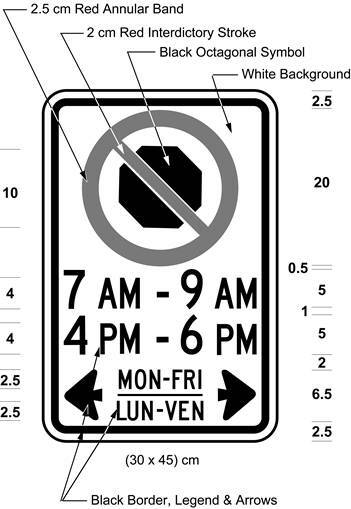 Text alternative: Illustration of “no stopping” sign with a black stop symbol inside of a red circle with an interdictory stroke indicating no stopping and the text “9 AM - 4 PM”, “4 PM - 6 PM”, and “MON-FRI / LUN-VEN”, with black arrows pointing left and right. The measurements are written below the sign: (30 × 45) cm. This text alternative is provided for convenience only and does not form part of the official law. O. Reg. 444/93, s. 4; O. Reg. 339/09, s. 9 (2). 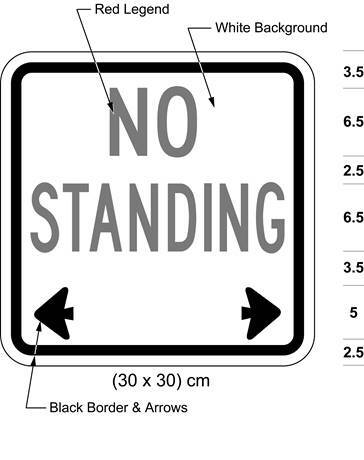 Text alternative: Illustration of “no standing” sign with red text “NO STANDING” on a white background with black arrows pointing left and right. The measurements are written below the sign: (30 × 30) cm. This text alternative is provided for convenience only and does not form part of the official law. R.R.O. 1990, Reg. 615, s. 15 (1); O. Reg. 339/09, s. 10 (1). 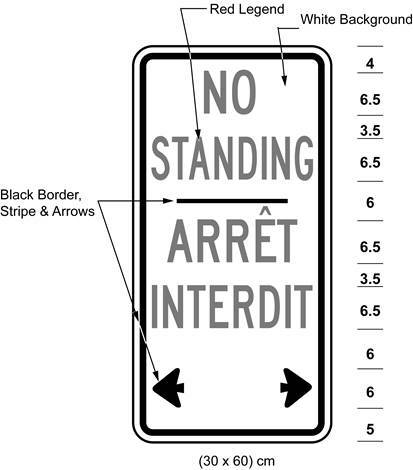 Text alternative: Illustration of “no standing” sign with red text “NO STANDING / ARRÊT INTERDIT” on a white background with black arrows pointing left and right. The measurements are written below the sign: (30 × 60) cm. This text alternative is provided for convenience only and does not form part of the official law. O. Reg. 444/93, s. 5; O. Reg. 339/09, s. 10 (2). 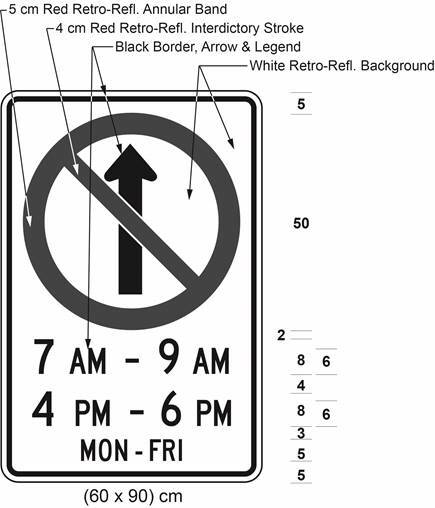 Text alternative: Illustration of “no standing” sign with red text “NO STANDING” on a white background and the text “7 AM - 9 AM”, “3 PM - 7 PM”, and “MON-FRI”, with black arrows pointing left and right. The measurements are written below the sign: (30 × 45) cm. This text alternative is provided for convenience only and does not form part of the official law. R.R.O. 1990, Reg. 615, s. 15 (2); O. Reg. 339/09, s. 10 (3). 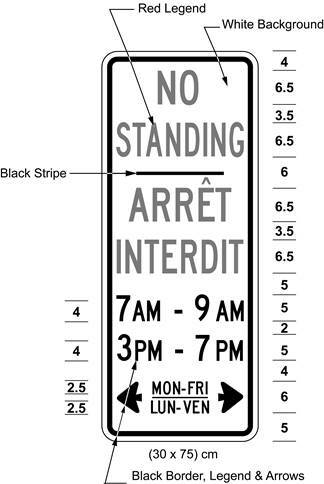 Text alternative: Illustration of “no standing” sign with red text “NO STANDING / ARRÊT INTERDIT” on a white background and the text “7 AM - 9 AM”, “3 PM - 7 PM”, and “MON-FRI / LUN-VEN”, with black arrows pointing left and right. The measurements are written below the sign: (30 × 75) cm. This text alternative is provided for convenience only and does not form part of the official law. O. Reg. 444/93, s. 5; O. Reg. 339/09, s. 10 (4). (3) On or after the 1st day of December, 1992, no sign restricting or prohibiting standing shall be valid except as prescribed and illustrated in subsection (1) or (2). O. Reg. 699/92, s. 1. 16. 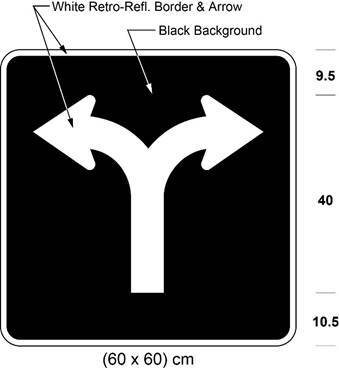 A yield right-of-way sign may be erected on a highway that intersects another highway. R.R.O. 1990, Reg. 615, s. 16. 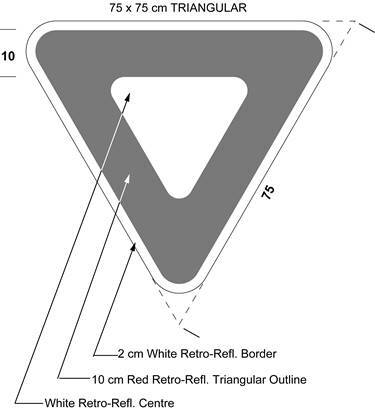 Text alternative: Illustration of yield right-of-way sign, with a white equilateral triangle inside a red equilateral triangle with a white retro-reflective border. This text alternative is provided for convenience only and does not form part of the official law. (d) be erected facing approaching traffic on the right side of the highway at a point not less than 1.5 metres and not more than 15 metres from the roadway of the intersecting highway or on a median not less than 1.5 metres and not more than 15 metres from a roadway of the intersecting divided highway. R.R.O. 1990, Reg. 615, s. 17; O. Reg. 339/09, s. 11. 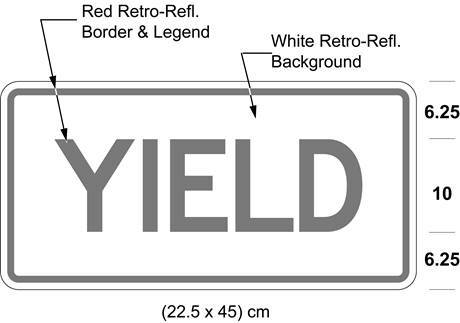 Text alternative: Illustration of yield right-of-way sign with red text “YIELD” on a white retro-reflective background with a red border. 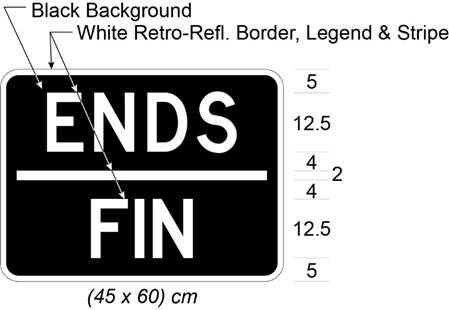 Sign size indicated (22.5 × 45) cm. This text alternative is provided for convenience only and does not form part of the official law. R.R.O. 1990, Reg. 615, s. 18; O. Reg. 339/09, s. 12 (1). Text alternative: Illustration of yield right-of-way sign with red text “YIELD / CÉDEZ” on a white retro-reflective background with a red border. Sign size indicated (30 × 45) cm. This text alternative is provided for convenience only and does not form part of the official law. O. Reg. 444/93, s. 6; O. Reg. 339/09, s. 12 (2). 19. 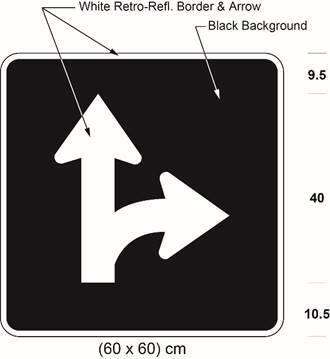 A yield right-of-way sign shall be erected so that the left edge of the sign is not more than 4 metres from the edge of the roadway. O. Reg. 175/08, s. 5. 20. Revoked: R.R.O. 1990, Reg. 615, s. 20.10. 20.1-20.3 Revoked: O. Reg. 407/15, s. 1. 20.4-20.6 Revoked: R.R.O. 1990, Reg. 615, s. 20.10. 20.7-20.9 Revoked: O. Reg. 175/08, s. 8. 20.10 Revoked: O. Reg. 407/15, s. 1. 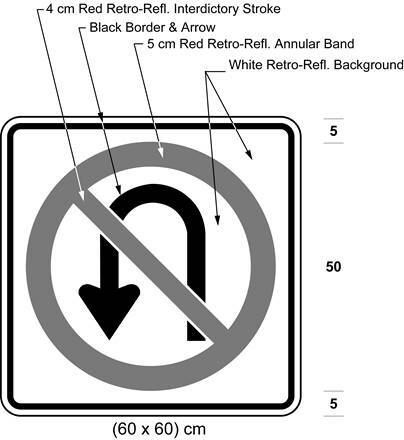 Text alternative: Illustration of a sign with a no right turn symbol consisting of a right turn black arrow inside a red circle with an interdictory stroke, on white retro-reflective background with a black border. Size indicated (60 × 60) cm. This text alternative is provided for convenience only and does not form part of the official law. R.R.O. 1990, Reg. 615, s. 21 (1); O. Reg. 339/09, s. 15 (1). 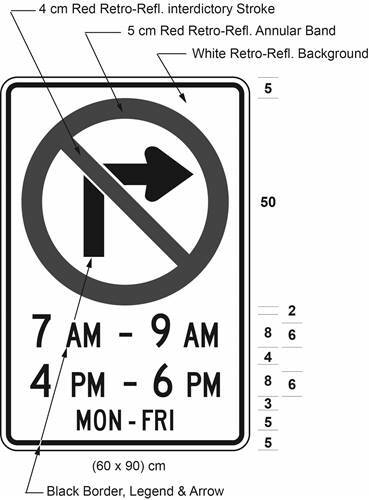 Text alternative: Illustration of a sign with a no right turn symbol consisting of a right turn black arrow inside a red circle with an interdictory stroke, on white retro-reflective background with a black border and the text “7 AM - 9 AM”, “4 PM - 6 PM”, “MON-FRI”. Size indicated (60 × 90) cm. This text alternative is provided for convenience only and does not form part of the official law. R.R.O. 1990, Reg. 615, s. 21 (2); O. Reg. 332/98, s. 2 (1); O. Reg. 339/09, s. 15 (2); O. Reg. 93/15, s. 1 (2). 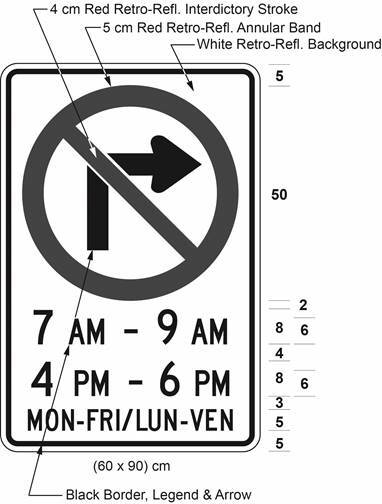 Text alternative: Illustration of a sign with a no right turn symbol consisting of a right turn black arrow inside a red circle with an interdictory stroke, on white retro-reflective background with a black border and the text “7 AM - 9 AM”, “4 PM - 6 PM”, “MON-FRI / LUN-VEN”. Size indicated (60 × 90) cm. This text alternative is provided for convenience only and does not form part of the official law. O. Reg. 444/93, s. 9 (1); O. Reg. 339/09, s. 15 (3); O. Reg. 93/15, s. 1 (1). 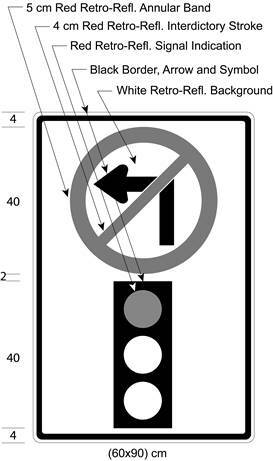 Text alternative: Illustration of a sign with a no right turn symbol consisting of a black right turn arrow inside a red circle with an interdictory stroke on white background above a symbol of a traffic signal light with the red light on. Size indicated (60 × 90) cm. This text alternative is provided for convenience only and does not form part of the official law. O. Reg. 332/98, s. 2 (2); O. Reg. 339/09, s. 15 (4). (3.1) On or after January 1, 2003, no sign prohibiting a right turn at a signalized intersection when the signal indication is red shall be valid except as prescribed and illustrated in subsection (3). O. Reg. 332/98, s. 2 (2). 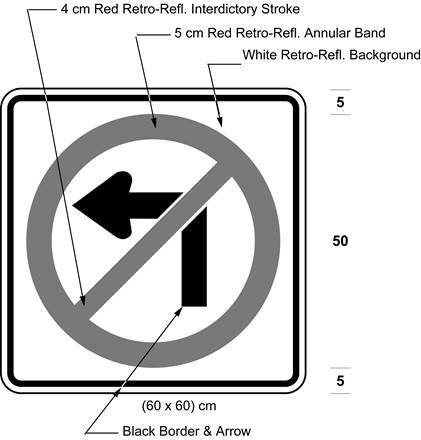 (3.2) Before January 1, 2003, no sign prohibiting a right turn at a signalized intersection when the signal indication is red, other than a sign as prescribed and illustrated in subsection (3), shall be valid unless it was authorized by this Regulation immediately before September 1, 1998. O. Reg. 332/98, s. 2 (2). (3.3) Revoked: O. Reg. 332/98, s. 2 (2). 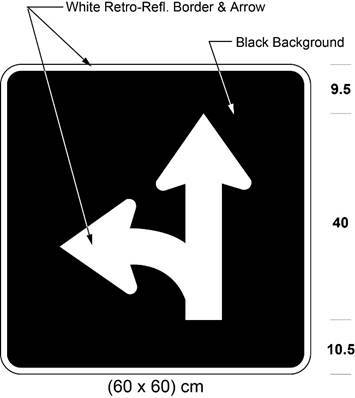 Text alternative: Illustration of a sign with a no left turn symbol consisting of a left turn black arrow inside a red circle with an interdictory stroke, on white retro-reflective background with a black border. Size indicated (60 × 60) cm. This text alternative is provided for convenience only and does not form part of the official law. R.R.O. 1990, Reg. 615, s. 21 (4); O. Reg. 339/09, s. 15 (5). 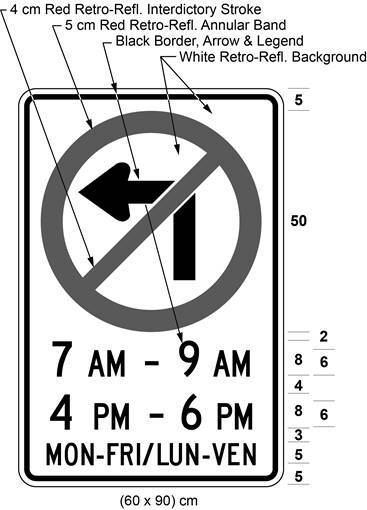 Text alternative: Illustration of a sign with a no left turn symbol consisting of a left turn black arrow inside a red circle with an interdictory stroke, on white retro-reflective background with a black border and the text “7 AM - 9 AM”, “4 PM - 6 PM”, “MON-FRI”. Size indicated (60 × 90) cm. This text alternative is provided for convenience only and does not form part of the official law. R.R.O. 1990, Reg. 615, s. 21 (5); O. Reg. 332/98, s. 2 (3); O. Reg. 339/09, s. 15 (6). 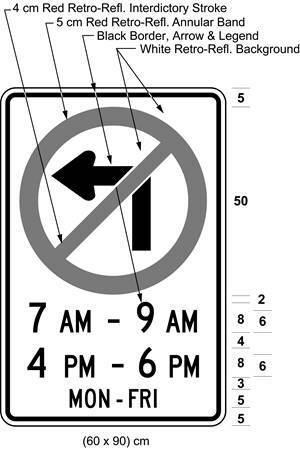 Text alternative: Illustration of a sign with a no left turn symbol consisting of a left turn black arrow inside a red circle with an interdictory stroke, on white retro-reflective background with a black border and the text “7 AM - 9 AM”, “4 PM - 6 PM”, “MON-FRI / LUN-VEN”. Size indicated (60 × 90) cm. This text alternative is provided for convenience only and does not form part of the official law. O. Reg. 444/93, s. 9 (2); O. Reg. 339/09, s. 15 (7); O. Reg. 93/15, s. 1 (3). Text alternative: Illustration of a sign with a no left turn symbol consisting of a black left turn arrow inside a red circle with an interdictory stroke on white background above a symbol of a traffic signal light with the red light on. Size indicated (60 × 90) cm. This text alternative is provided for convenience only and does not form part of the official law. O. Reg. 332/98, s. 2 (4); O. Reg. 339/09, s. 15 (8). 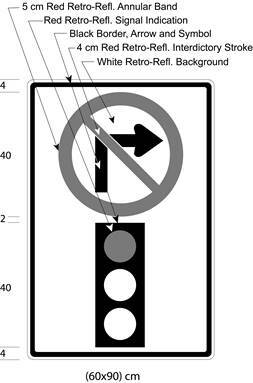 (6.1) On or after January 1, 2003, no sign prohibiting a left turn at a signalized intersection when the signal indication is red shall be valid except as prescribed and illustrated in subsection (6). O. Reg. 332/98, s. 2 (4). 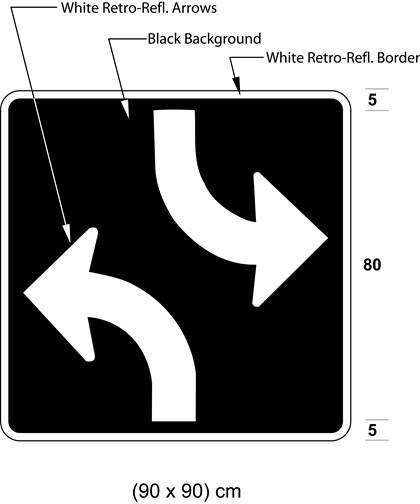 (6.2) Before January 1, 2003, no sign prohibiting a left turn at a signalized intersection when the signal indication is red, other than a sign as prescribed and illustrated in subsection (6), shall be valid unless it was authorized by this Regulation immediately before September 1, 1998. O. Reg. 332/98, s. 2 (4). (6.3) Revoked: O. Reg. 332/98, s. 2 (4). (7) Revoked: O. Reg. 699/92, s. 3 (2). 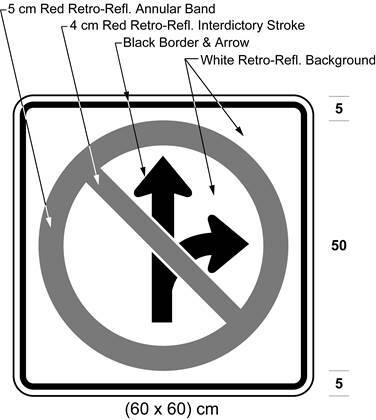 Text alternative: Illustration of a sign with a “No right turn or proceeding straight” symbol consisting of branching black arrows curving right and proceeding straight, inside a red a circle with an interdictory stroke on white retro-reflective background with a black border. 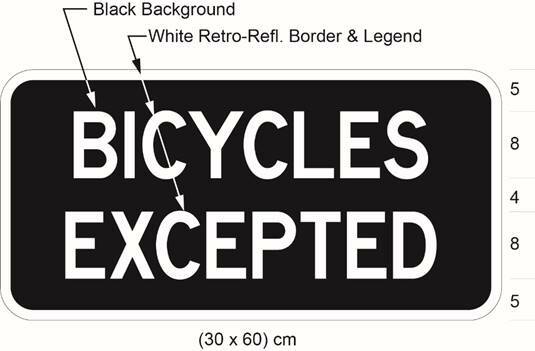 Indicated sign size (60 × 60) cm. This text alternative is provided for convenience only and does not form part of the official law. R.R.O. 1990, Reg. 615, s. 22 (1); O. Reg. 332/98, s. 3 (1); O. Reg. 339/09, s. 16 (1). 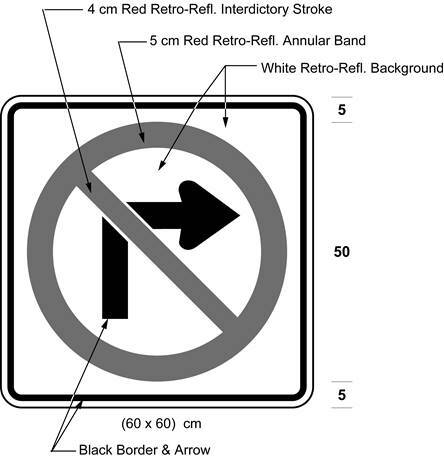 Text alternative: Illustration of a sign with a “No left turn or proceeding straight” symbol consisting of branching black arrows curving left and proceeding straight, inside a red a circle with an interdictory stroke on white retro-reflective background with a black border. 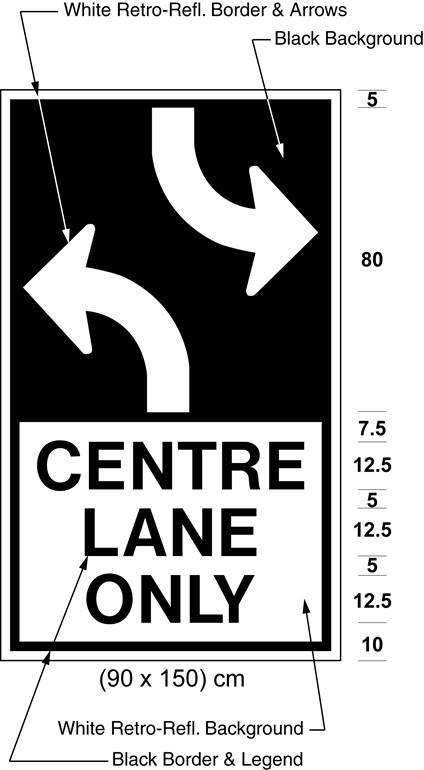 Indicated sign size (60 × 60) cm. This text alternative is provided for convenience only and does not form part of the official law. R.R.O. 1990, Reg. 615, s. 22 (2); O. Reg. 332/98, s. 3 (2); O. Reg. 339/09, s. 16 (2). 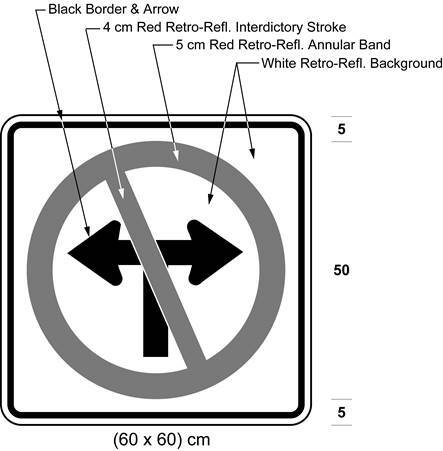 Text alternative: Illustration of a sign with a “No left turn or right turn” symbol consisting of branching black arrows curving left and curving right, inside a red a circle with an interdictory stroke on white retro-reflective background with a black border. 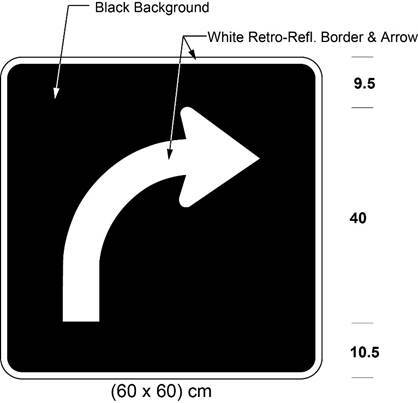 Indicated sign size (60 × 60) cm. This text alternative is provided for convenience only and does not form part of the official law. R.R.O. 1990, Reg. 615, s. 22 (3); O. Reg. 332/98, s. 3 (3); O. Reg. 339/09, s. 16 (3). (c) prohibits both a left and a right turn shall be valid except as prescribed and illustrated in subsection (3). R.R.O. 1990, Reg. 615, s. 22 (4). Text alternative: Illustration of a sign with a “No proceeding straight” symbol consisting of a black arrow proceeding straight, inside a red a circle with an interdictory stroke on white retro-reflective background with a black border. 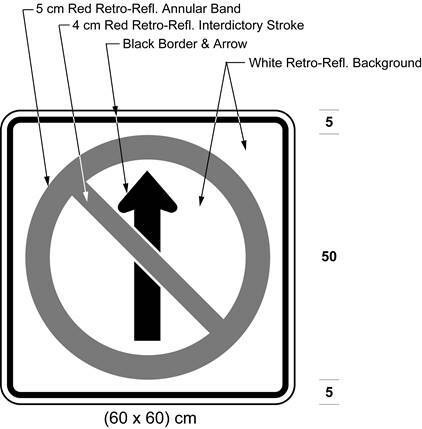 Indicated sign size (60 × 60) cm. This text alternative is provided for convenience only and does not form part of the official law. R.R.O. 1990, Reg. 615, s. 22 (5); O. Reg. 332/98, s. 3 (4); O. Reg. 339/09, s. 16 (4). (6) Subsection (5) does not apply to a DO NOT ENTER sign as prescribed and illustrated in section 31. R.R.O. 1990, Reg. 615, s. 22 (6). 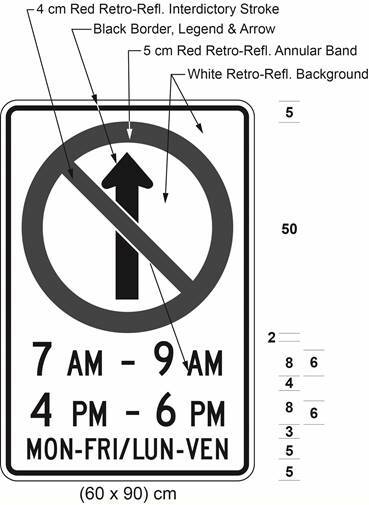 Text alternative: Illustration of a sign with a no proceeding straight symbol consisting of a black arrow proceeding straight, inside a red a circle with an interdictory stroke on white retro-reflective background with a black border, and the text “7 AM - 9 AM”, “4 PM - 6 PM”, and “MON-FRI”. Indicated size (60 × 90) cm. This text alternative is provided for convenience only and does not form part of the official law. R.R.O. 1990, Reg. 615, s. 22 (7); O. Reg. 332/98, s. 3 (5); O. Reg. 339/09, s. 16 (5); O. Reg. 93/15, s. 2 (1). Text alternative: Illustration of a sign with a no proceeding straight symbol consisting of a black arrow proceeding straight, inside a red a circle with an interdictory stroke on white retro-reflective background with a black border, and the text “7 AM - 9 AM”, “4 PM - 6 PM”, and “MON-FRI / LUN-VEN”. Indicated size (60 × 90) cm. This text alternative is provided for convenience only and does not form part of the official law. O. Reg. 444/93, s. 10 (1); O. Reg. 339/09, s. 16 (6); O. Reg. 93/15, s. 2 (2). (8), (9) Revoked: O. Reg. 332/98, s. 3 (6). 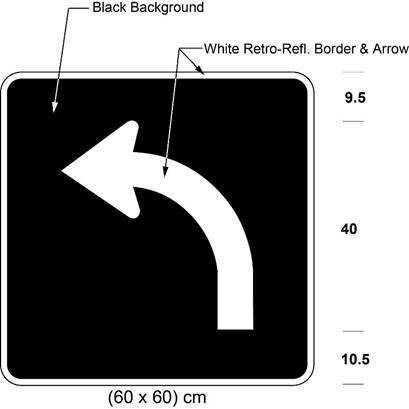 Text alternative: Illustration of a sign with a “No U-turn” symbol consisting of a curving u-shaped black arrow inside a red circle with an interdictory stroke, on white retro-reflective background with a black border. Indicated size (60 × 60) cm. This text alternative is provided for convenience only and does not form part of the official law. R.R.O. 1990, Reg. 615, s. 23; O. Reg. 339/09, s. 17. 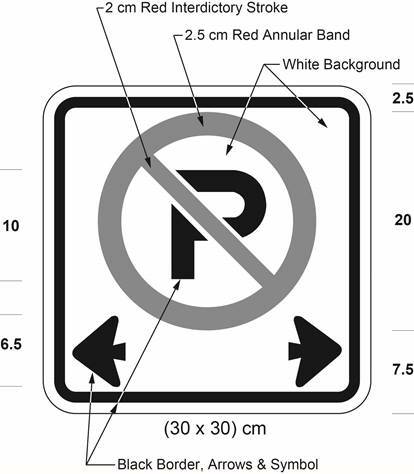 Text alternative: Illustration of a sign with a no parking symbol consisting of a black letter “P” inside a red circle with an interdictory stroke above two black arrows pointing left and right, on a white background with a black border. Indicated size (30 × 30) cm. This text alternative is provided for convenience only and does not form part of the official law. R.R.O. 1990, Reg. 615, s. 24; O. Reg. 339/09, s. 18; O. Reg. 93/15, s. 3. 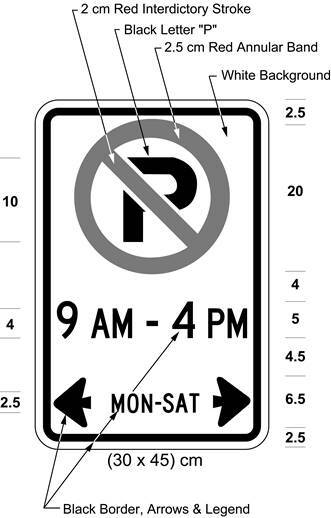 Text alternative: Illustration of a sign with a “No parking” symbol consisting of a black letter “P” inside a red circle with an interdictory stroke above the text “9 AM - 4 PM”, “MON-SAT”, with left and right black arrows, on a white background with a black border. Indicated size (30 × 45) cm. This text alternative is provided for convenience only and does not form part of the official law. R.R.O. 1990, Reg. 615, s. 25; O. Reg. 339/09, s. 19 (1). 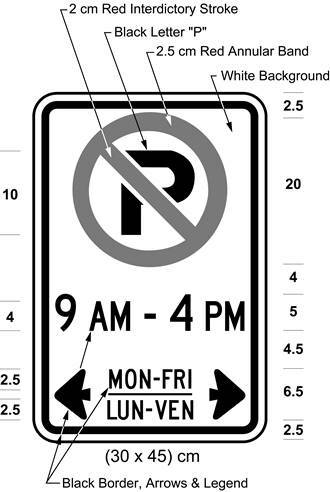 Text alternative: Illustration of a sign with a “No parking” symbol consisting of a black letter “P” inside a red circle with an interdictory stroke above the text “9 AM - 4 PM”, “MON-SAT / LUN-VEN”, with left and right black arrows, on a white background with a black border. Indicated size (30 × 45) cm. This text alternative is provided for convenience only and does not form part of the official law. O. Reg. 444/93, s. 11; O. Reg. 339/09, s. 19 (2). 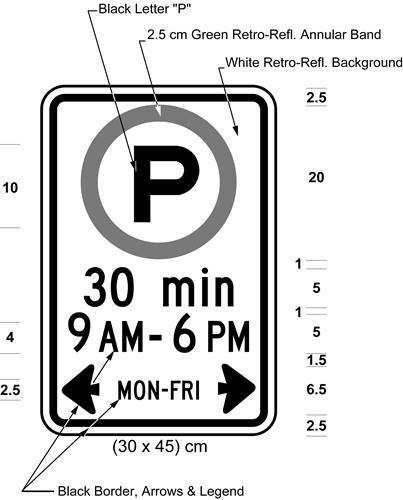 Text alternative: Illustration of a sign with a “Parking” symbol consisting of a black letter “P” inside a green permissive circle and the text “30 min”, “9 AM - 6 PM”, “MON-FRI”, with left and right black arrows, on a white retro-reflective background with a black border. Indicated size (30 × 45) cm. This text alternative is provided for convenience only and does not form part of the official law. R.R.O. 1990, Reg. 615, s. 26; O. Reg. 63/06, s. 4 (1); O. Reg. 339/09, s. 20 (1). 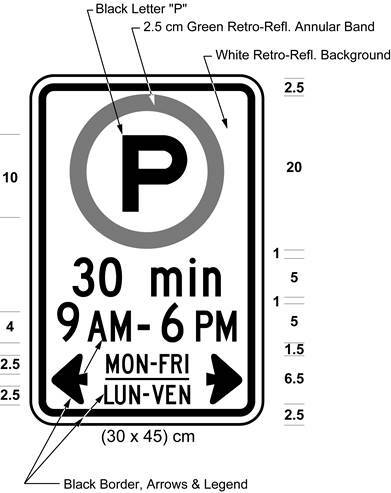 Text alternative: Illustration of a sign with a “Parking” symbol consisting of a black letter “P” inside a green permissive circle and the text “30 min”, “9 AM - 6 PM”, “MON-FRI / LUN-VEN”, with left and right black arrows, on a white retro-reflective background with a black border. Indicated size (30 × 45) cm. This text alternative is provided for convenience only and does not form part of the official law. O. Reg. 444/93, s. 12; O. Reg. 63/06, s. 4 (2); O. Reg. 339/09, s. 20 (2). 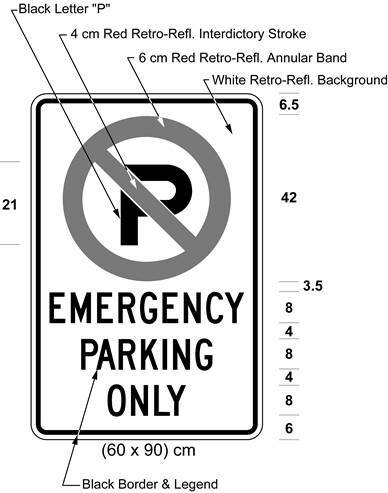 Text alternative: Illustration of a sign with a “No parking” symbol consisting of a black letter “P” inside a red circle with an interdictory stroke, above the text “EMERGENCY PARKING ONLY”, on white retro-reflective background with a black border. Indicated size (60 × 90) cm. This text alternative is provided for convenience only and does not form part of the official law. R.R.O. 1990, Reg. 615, s. 27; O. Reg. 339/09, s. 21 (1). 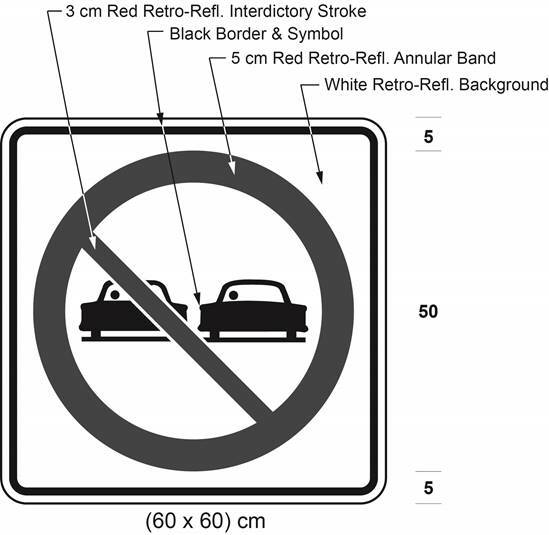 Text alternative: Illustration of a sign with a no parking symbol consisting of a black letter “P” inside a red circle with an interdictory stroke, above the text “STATIONNEMENT D’URGENCE SEULEMENT”, on white retro-reflective background with a black border. Indicated size (60 × 90) cm. This text alternative is provided for convenience only and does not form part of the official law. O. Reg. 444/93, s. 13; O. Reg. 339/09, s. 21 (2); O. Reg. 93/15, s. 4. (ii) a building or facility is situated which is frequently visited by school children under supervision of their teachers. R.R.O. 1990, Reg. 615, s. 28. 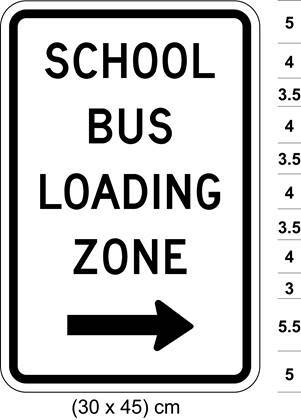 Text alternative: Illustration of sign with the text “SCHOOL BUS LOADING ZONE” above a black arrow pointing right, on a white background with a black border. Indicated size (30 × 45) cm. This text alternative is provided for convenience only and does not form part of the official law. R.R.O. 1990, Reg. 615, s. 29 (1); O. Reg. 339/09, s. 22 (1). 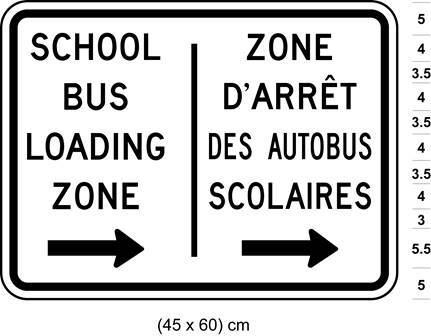 Text alternative: Illustration of sign with the text “SCHOOL BUS LOADING ZONE / ZONE D'ARRÊT DES AUTOBUS SCOLAIRES” above black arrows pointing right, on a white background with a black border. Indicated size (45 × 60) cm. This text alternative is provided for convenience only and does not form part of the official law. O. Reg. 444/93, s. 14; O. Reg. 339/09, s. 22 (2). 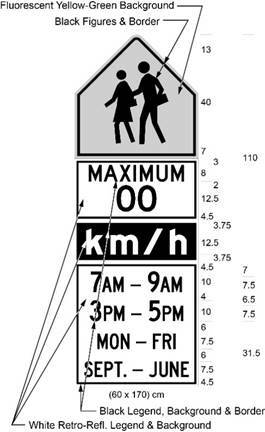 (2) One sign with a single headed arrow pointing towards the loading zone shall be erected at each end of a school bus loading zone and, where the length of the loading zone exceeds 60 metres, signs with double headed arrows shall be erected at intervals of no more than 45 metres. R.R.O. 1990, Reg. 615, s. 29 (2). R.R.O. 1990, Reg. 615, s. 30 (1); O. Reg. 339/09, s. 23; O. Reg. 93/15, s. 5. 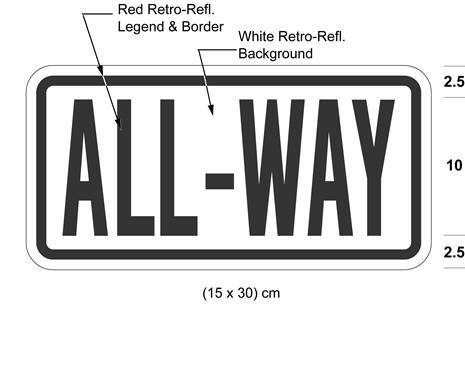 (2) A One-Way sign shall be used, with the arrow pointing in the appropriate direction, to indicate the highways upon which traffic is allowed to travel in one direction only. R.R.O. 1990, Reg. 615, s. 30 (2). R.R.O. 1990, Reg. 615, s. 31; O. Reg. 339/09, s. 24. R.R.O. 1990, Reg. 615, s. 32; O. Reg. 339/09, s. 25 (1); O. Reg. 93/15, s. 6. O. Reg. 444/93, s. 15; O. Reg. 339/09, s. 25 (2). 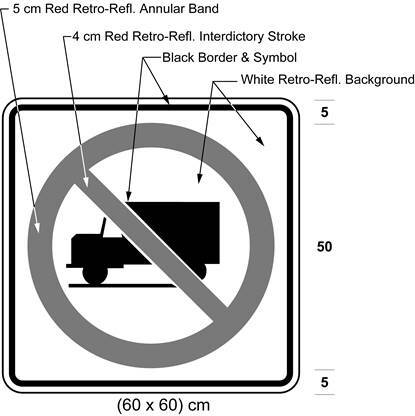 Text alternative: Illustration of a no heavy trucks sign consisting of a truck symbol inside a red circle with an interdictory stroke, on a white retro-reflective background with a black border. Indicated size (60 × 60) cm. This text alternative is provided for convenience only and does not form part of the official law. R.R.O. 1990, Reg. 615, s. 33; O. Reg. 339/09, s. 26. 34. 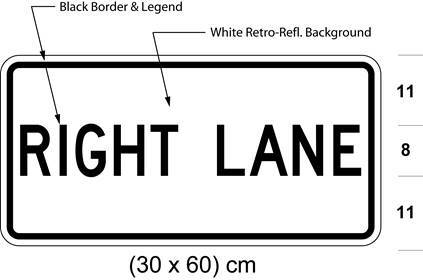 (1) A Lane Designation sign shall be used to indicate by means of a single arrow or a combination of arrows the only permitted movement or movements by vehicles on one or more lanes of a highway marked with the sign. R.R.O. 1990, Reg. 615, s. 34 (1). R.R.O. 1990, Reg. 615, s. 34 (2); O. Reg. 444/93, s. 16 (1, 2); O. Reg. 339/09, s. 27 (1); O. Reg. 93/15, s. 7 (1). 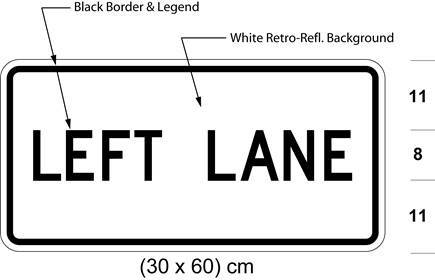 (3) A Lane Designation sign in Figure 7 signifies that the lane marked with the sign shall be used by a vehicle for the purpose only of making a left turn. R.R.O. 1990, Reg. 615, s. 34 (3). 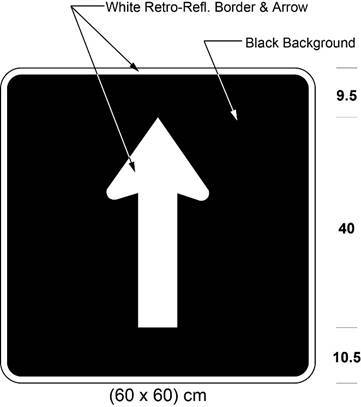 (d) shall, in the case of Figure 10, be ground mounted to the right of the highway, facing the approaching traffic, directly below or up to 100 metres beyond the sign in Figure 9. R.R.O. 1990, Reg. 615, s. 34 (4); O. Reg. 444/93, s. 16 (3). 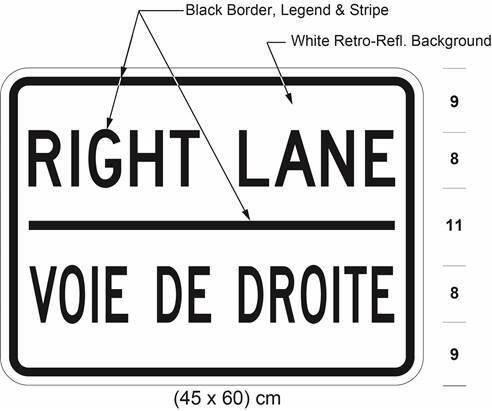 (b) in the case of Figure 2, bear the legend “Right Lane”. R.R.O. 1990, Reg. 615, s. 34 (5); O. Reg. 339/09, s. 27 (2). 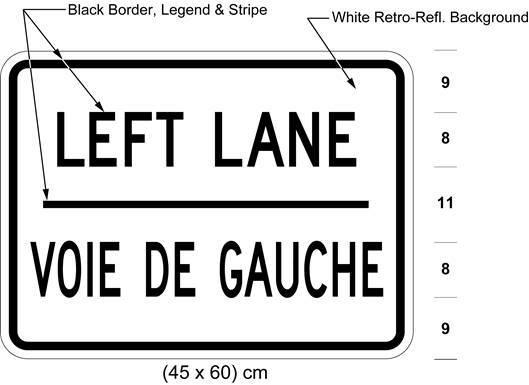 (b) in the case of Figure 2, bears the legend “Right Lane – Voie de droite”. O. Reg. 444/93, s. 16 (4); O. Reg. 909/93, s. 1; O. Reg. 339/09, s. 27 (3); O. Reg. 93/15, s. 7 (2). R.R.O. 1990, Reg. 615, s. 35; O. Reg. 339/09, s. 28; O. Reg. 93/15, s. 8. R.R.O. 1990, Reg. 615, s. 36; O. Reg. 339/09, s. 29; O. Reg. 93/15, s. 9. R.R.O. 1990, Reg. 615, s. 37; O. Reg. 339/09, s. 30. R.R.O. 1990, Reg. 615, s. 38; O. Reg. 339/09, s. 31. R.R.O. 1990, Reg. 615, s. 39 (1); O. Reg. 339/09, s. 32 (1). 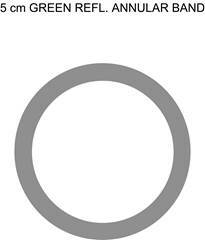 (2) An annular green band as illustrated in the following Figure is a symbol that when used on a sign prescribed by this Regulation signifies that whatever is depicted within the symbol is permitted. R.R.O. 1990, Reg. 615, s. 39 (2); O. Reg. 339/09, s. 32 (2). O. Reg. 339/09, s. 33 (1). O. Reg. 175/08, s. 9 (1); O. Reg. 339/09, s. 33 (2). (3) Revoked: O. Reg. 175/08, s. 9 (3). 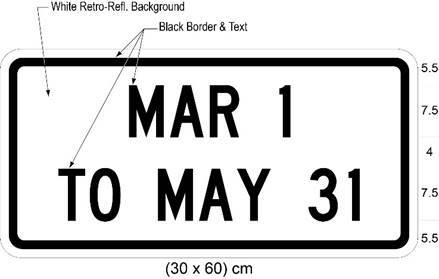 (4) On and after January 1, 2015, every Load Restriction sign shall bear the markings and have the dimensions as prescribed and illustrated in subsection (1). O. Reg. 339/09, s. 33 (5). 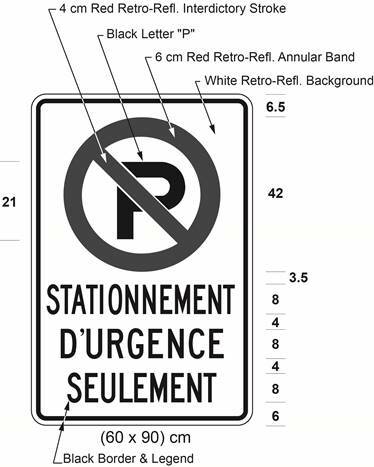 40.1 (1) A Load Restriction sign erected on or after January 1, 2015 in an area designated by the French Language Services Act shall bear the markings and have the dimensions as prescribed and illustrated in subsection 40 (1). O. Reg. 339/09, s. 34 (1). O. Reg. 175/08, s. 10 (1); O. Reg. 339/09, s. 34 (2). (3) Revoked: O. Reg. 175/08, s. 10 (3). O. Reg. 175/08, s. 10 (1); O. Reg. 339/09, s. 34 (3, 4). 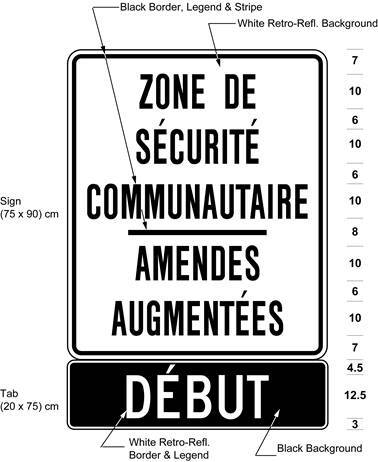 (4) On and after January 1, 2015, every Load Restriction sign in an area designated by the French Language Services Act shall bear the markings and have the dimensions as prescribed and illustrated in subsection 40 (1). O. Reg. 339/09, s. 34 (5). (a.1) Revoked: O. Reg. 246/03, s. 3 (3). Figure 1.1 Revoked: O. Reg. 246/03, s. 3 (3). (b.1) Revoked: O. Reg. 246/03, s. 3 (6). Figure 2.1 Revoked: O. Reg. 246/03, s. 3 (6). R.R.O. 1990, Reg. 615, s. 41 (1); O. Reg. 444/93, s. 18; O. Reg. 246/03, s. 3 (1-6); O. Reg. 339/09, s. 35; O. Reg. 93/15, s. 10. (1.1) Revoked: O. Reg. 175/08, s. 11 (2). 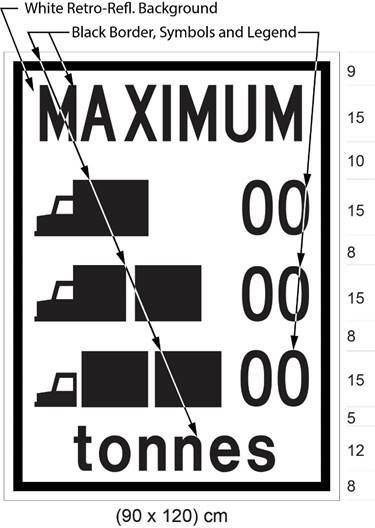 (2) The prescribed maximum gross vehicle weight indicated on a sign prescribed by this section shall be such weight as is prescribed by a regulation or by-law made under section 123 of the Act. R.R.O. 1990, Reg. 615, s. 41 (2). 42. 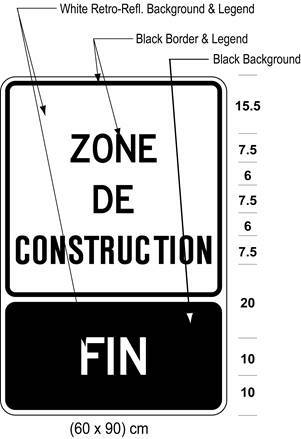 (1) A part of a highway that has been designated as a construction zone shall be marked at the commencement and at the end of the construction zone with construction zone signs erected on the right side of the highway, facing approaching traffic and not more than 4.5 metres from the roadway, with the bottom edge of the sign not less than 1.5 metres or more than 2.5 metres above the level of the roadway. O. Reg. 63/06, s. 5. O. Reg. 63/06, s. 5; O. Reg. 175/08, s. 12 (1); O. Reg. 339/09, s. 36 (1); O. Reg. 93/15, s. 11 (1). O. Reg. 63/06, s. 5; O. Reg. 175/08, s. 12 (2); O. Reg. 339/09, s. 36 (2); O. Reg. 93/15, s. 11 (2). O. Reg. 63/06, s. 5; O. Reg. 175/08, s. 12 (3); O. Reg. 339/09, s. 36 (3). O. Reg. 63/06, s. 5; O. Reg. 175/08, s. 12 (4); O. Reg. 339/09, s. 36 (4). (e) be maintained in a clean and legible condition. O. Reg. 63/06, s. 5. 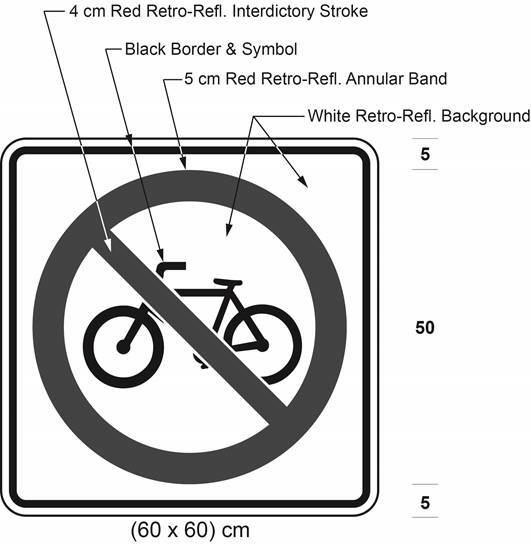 (2) One side of a traffic control stop or slow sign shall be high-intensity retro-reflective grade red in colour with the word “stop” in the centre of the sign written in legible high-intensity retro-reflective grade white upper case letters 150 millimetres high. O. Reg. 63/06, s. 5. 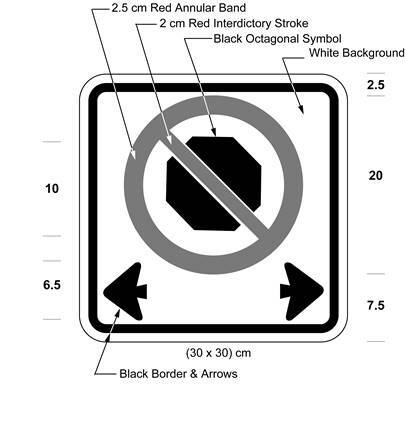 (3) The other side of a traffic control stop or slow sign shall be retro-reflective fluorescent yellow-green in colour with a black diamond-shaped border that is at least 317 millimetres by 317 millimetres and the word “slow” in the centre of the sign written in legible black upper case letters 120 millimetres high. O. Reg. 175/08, s. 13. R.R.O. 1990, Reg. 615, s. 43 (1); O. Reg. 339/09, s. 37 (1). O. Reg. 444/93, s. 19; O. Reg. 339/09, s. 37 (2). 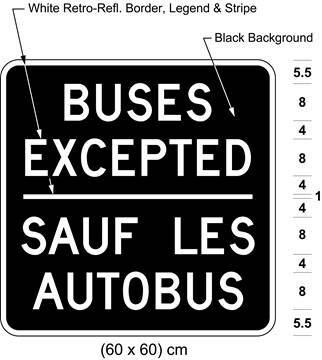 (2) A Buses Excepted tab sign as prescribed and illustrated in subsection (1) or (1.1) may be erected immediately below a sign prescribed in section 21, 22 or 34. O. Reg. 175/08, s. 14. (b) bear the markings and have the dimensions as illustrated in Figure 1. O. Reg. 148/97, s. 1; O. Reg. 335/15, s. 2 (1). (b) bear the markings and have the dimensions as illustrated in Figure 2. O. Reg. 148/97, s. 1; O. Reg. 335/15, s. 2 (2). (b) bear the markings and have the dimensions as illustrated in Figure 3. O. Reg. 148/97, s. 1; O. Reg. 335/15, s. 2 (3). (b) bear the markings and have the dimensions as illustrated in Figure 4. O. Reg. 148/97, s. 1; O. Reg. 335/15, s. 2 (4). (5) Revoked: O. Reg. 335/15, s. 2 (5). 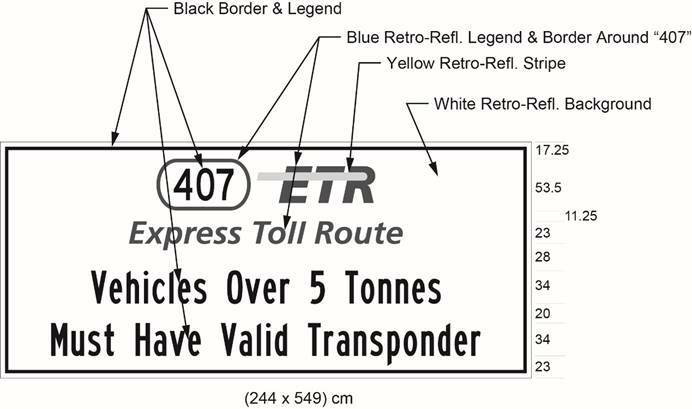 Text alternative: Illustration of sign with “407 ETR” symbol above the words “Express Toll Route” and the text “Vehicles Over 5 Tonnes Must Have Valid Transponder”, on a white retro-reflective background with a black border. Indicated sign size: (240 × 540) cm. This text alternative is provided for convenience only and does not form part of the official law. 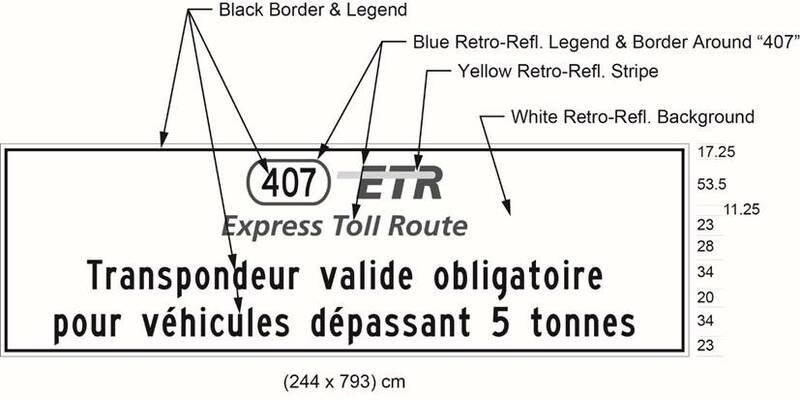 Text alternative: Illustration of sign with 407 ETR symbol above the words “Express Toll Route” and the text “Transpondeur valide obligatoire pour véhicules dépassant 5 tonnes”, on a white retro-reflective background with a black border. Indicated sign size: (240 × 810) cm. This text alternative is provided for convenience only and does not form part of the official law. 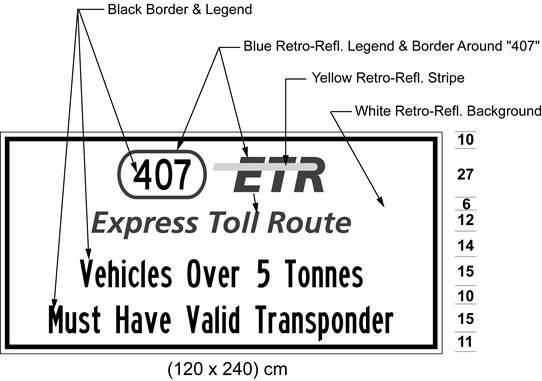 Text alternative: Illustration of sign with “407 ETR” symbol above the words “Express Toll Route” and the text “Vehicles Over 5 Tonnes Must Have Valid Transponder”, on a white retro-reflective background with a black border. Indicated sign size: (120 × 240) cm. This text alternative is provided for convenience only and does not form part of the official law. 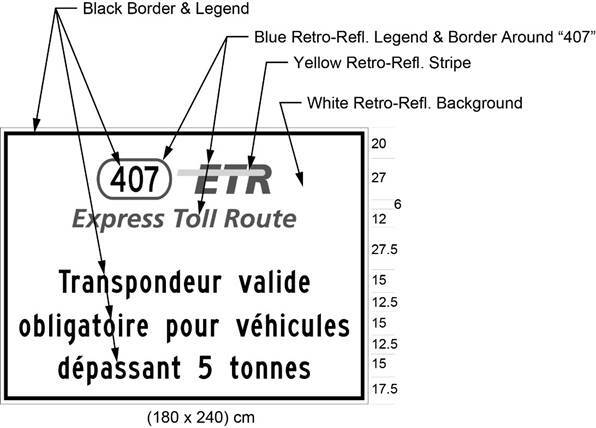 Text alternative: Illustration of sign with “407 ETR” symbol above the words “Express Toll Route” and the text “Transpondeur valide obligatoire pour véhicules dépassant 5 tonnes”, on a white retro-reflective background with a black border. Indicated sign size: (180 × 240) cm. This text alternative is provided for convenience only and does not form part of the official law. O. Reg. 148/97, s. 1; O. Reg. 339/09, s. 38; O. Reg. 93/15, s. 12. 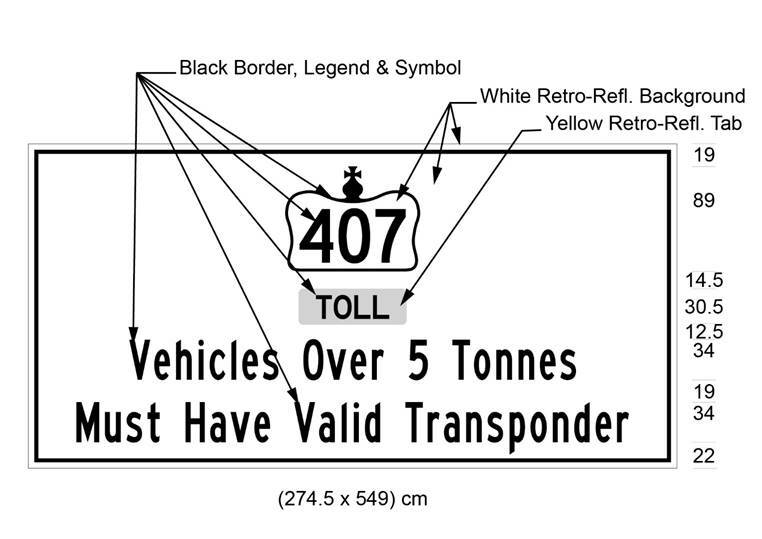 Text alternative: Illustration of sign with “407” inside a Crown symbol above the word “Toll” and the text “Vehicles Over 5 Tonnes Must Have Valid Transponder”. The word “Toll” is on a yellow retro-reflective background and the rest of the sign is a white retro-reflective background with a black border. 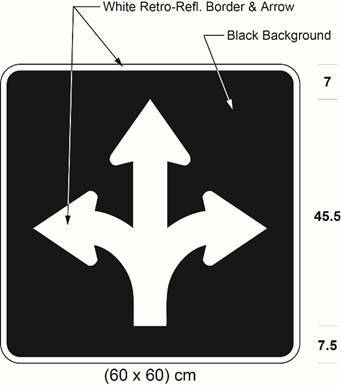 Indicated sign size: (274.5 × 549) cm. This text alternative is provided for convenience only and does not form part of the official law. O. Reg. 335/15, s. 3; O. Reg. 483/17, s. 2 (1). 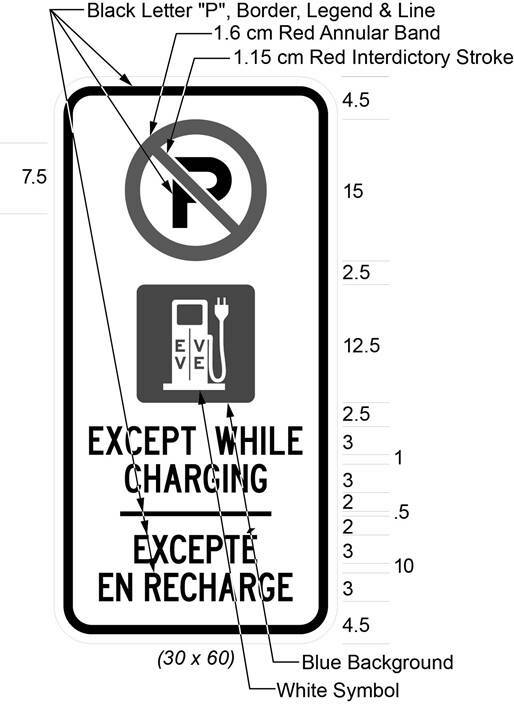 Text alternative: Illustration of sign with “407” inside a Crown symbol above the words “Toll / Péage” and the text “Vehicles Over 5 Tonnes Must Have Valid Transponder”. 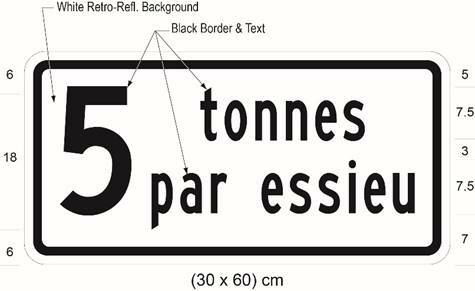 The words “Toll / Péage” are on a yellow retro-reflective background and the rest of the sign is a white retro-reflective background with a black border. Indicated sign size: (274.5 × 549) cm. This text alternative is provided for convenience only and does not form part of the official law. O. Reg. 483/17, s. 2 (2). Text alternative: Illustration of sign with “407” inside a Crown symbol above the word “Toll” and the text “Vehicles Over 5 Tonnes Must Have Valid Transponder”. The word “Toll” is on a yellow retro-reflective background and the rest of the sign is a white retro-reflective background with a black border. Indicated sign size: (180 × 240) cm. This text alternative is provided for convenience only and does not form part of the official law. O. Reg. 335/15, s. 3. Text alternative: Illustration of sign with “412” inside a Crown symbol above the word “Toll” and the text “Vehicles Over 5 Tonnes Must Have Valid Transponder”. The word “Toll” is on a yellow retro-reflective background and the rest of the sign is a white retro-reflective background with a black border. 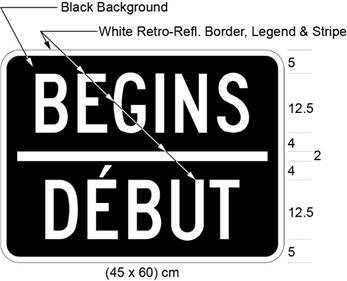 Indicated sign size: (274.5 × 549) cm. This text alternative is provided for convenience only and does not form part of the official law. Text alternative: Illustration of sign with “412” inside a Crown symbol above the word “Toll” and the text “Vehicles Over 5 Tonnes Must Have Valid Transponder”. The word “Toll” is on a yellow retro-reflective background and the rest of the sign is a white retro-reflective background with a black border. Indicated sign size: (180 × 240) cm. This text alternative is provided for convenience only and does not form part of the official law. Text alternative: Illustration of sign with “418” inside a Crown symbol above the word “Toll” and the text “Vehicles Over 5 Tonnes Must Have Valid Transponder”. The word “Toll” is on a yellow retro-reflective background and the rest of the sign is a white retro-reflective background with a black border. 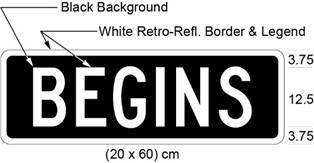 Indicated sign size: (274.5 × 549) cm. This text alternative is provided for convenience only and does not form part of the official law. O. Reg. 483/17, s. 3. Text alternative: Illustration of sign with “418” inside a Crown symbol above the word “Toll” and the text “Vehicles Over 5 Tonnes Must Have Valid Transponder”. The word “Toll” is on a yellow retro-reflective background and the rest of the sign is a white retro-reflective background with a black border. Indicated sign size: (180 × 240) cm. This text alternative is provided for convenience only and does not form part of the official law. Text alternative: Illustration of sign with “407” and “412”, each inside a Crown symbol and each above the words “Toll / Péage” and the text “Vehicles Over 5 Tonnes Must Have Valid Transponder”. The words “Toll / Péage” are on a yellow retro-reflective background and the rest of the sign is a white retro-reflective background with a black border. 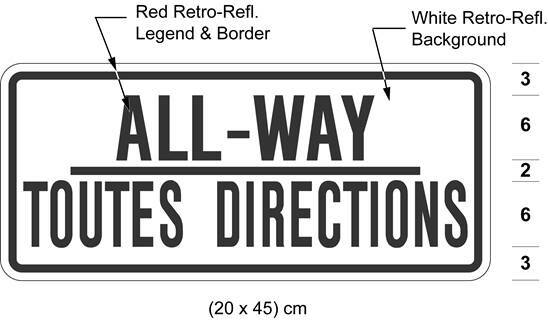 Indicated sign size: (274.5 × 549) cm. This text alternative is provided for convenience only and does not form part of the official law. O. Reg. 335/15, s. 3; O. Reg. 483/17, s. 4 (1). 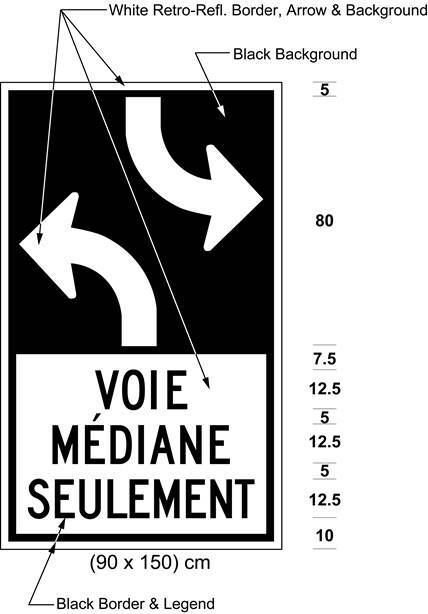 Text alternative: Illustration of sign with “407” and “418”, each inside a Crown symbol and each above the words “Toll / Péage” and the text “Vehicles Over 5 Tonnes Must Have Valid Transponder”. 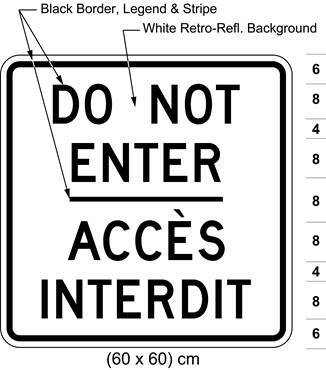 The words “Toll / Péage” are on a yellow retro-reflective background and the rest of the sign is a white retro-reflective background with a black border. 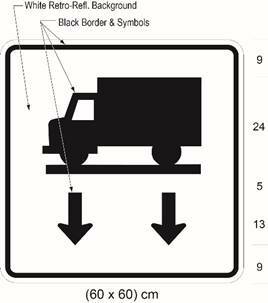 Indicated sign size: (274.5 × 549) cm. This text alternative is provided for convenience only and does not form part of the official law. O. Reg. 483/17, s. 4 (2). 44. The dimensions of a sign may be greater than the dimensions prescribed and illustrated in this Regulation so long as each dimension is increased and, when increased, has the same relation to the other dimensions of the sign as the dimensions prescribed and illustrated in this Regulation have to each other. R.R.O. 1990, Reg. 615, s. 44. 46. No person, other than a municipal corporation or other authority having jurisdiction over a highway, shall erect or maintain a sign prescribed by the Act and regulations. R.R.O. 1990, Reg. 615, s. 46. 47. 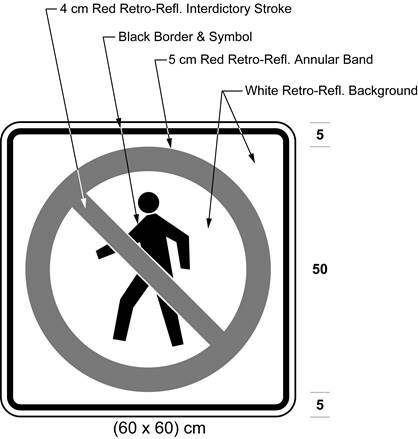 Where the characteristics of a highway make it impracticable to place a sign or pavement markings as specified in this Regulation, the sign or pavement markings shall be placed so as to comply as nearly as practicable with those requirements. O. Reg. 699/92, s. 5. 48. No speed limit sign bearing the words “speed limit” is valid. R.R.O. 1990, Reg. 615, s. 48. 49. 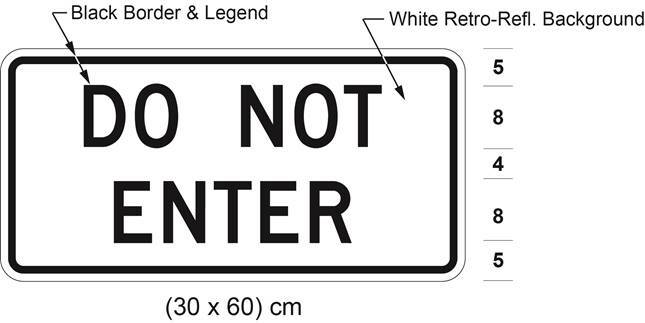 Where a sign is erected in accordance with sections 21, 22, 23 and 34, the sign is internally illuminated, or changed by means of dot or disc matrix or louvers, the sign shall only be legible to approaching drivers during the time of operation and shall comply as nearly as practicable with those requirements and dimensions as prescribed. R.R.O. 1990, Reg. 615, s. 49. 50. (1) A sign prescribed by a provision of this Regulation may show days and times other than those shown in the Figure to that provision. O. Reg. 175/08, s. 16. (2) A sign prescribed by a provision of this Regulation shall show the prescribed speed and not 00 km/h, if that is the speed shown in the Figure to that provision. O. Reg. 175/08, s. 16. (3) The signs prescribed by clauses 41 (1) (a) and (b) shall show the prescribed number of tonnes and not 00 tonnes as shown in the Figures to those clauses. O. Reg. 175/08, s. 16. 51. For the purposes of this Regulation, an area designated by the French Language Services Act means an area designated in Schedule 1 to that Act. O. Reg. 444/93, s. 20. 52. 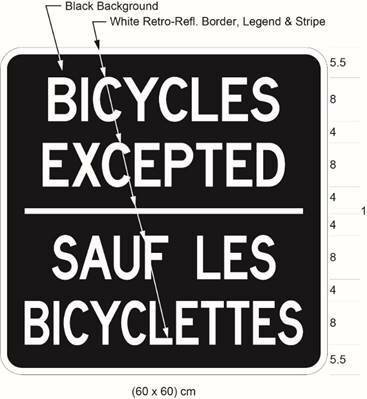 A municipality situated in an area designated by the French Language Services Act is not required to comply with the sign requirements for such areas unless it has passed a by-law under section 14 of that Act. O. Reg. 444/93, s. 20.